Background: Sclerostin (SOST) is a secretary product of osteocytes and it is a glycoprotein expressed by SOST gene. It is well studied and established that sclerostin inhibits the bone formation by blocking Wnt signaling pathway. SOST gene acts as a potential therapeutic target for treating autosomal disorders, like van Buchem disease and sclerosteosis. Bioinformatics analysis of SOST gene shall provide exhaustive insights into the evolutionary origin of the gene sequence and its functional characteristics. Objective: In this review, we focus on presenting comprehensive information on SOST gene, its regulation and its role in van Buchem disease and sclerosteosis along with insilico analyses of its sequences. Method: The review on SOST gene and its mediation was done using various reports already published and other online resources. Bioinformatics tools and database such as BioGPS, Uniprot, MEGA and STRING were used for sequence analysis. Results: An overview on the regulation of SOST gene, its inhibitors and their pharmacological effects is presented. The molecular phylogenetic study and functional characterization suggested the conservation of SOST sequences among various species and the molecular pathway associated with SOST. Conclusion: The mediation of SOST gene under normal and disease conditions has hinted it as a potential therapeutic target, which is further confirmed through bioinformatics approaches. This paves way to attempt a possible regulation of SOST gene action involving peptide / peptidomimetic molecules and charged nanoparticles, especially during orthodontic treatments. 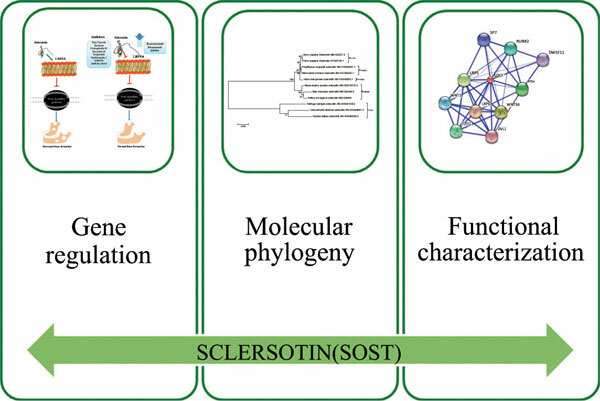 Sclerostin, SOST gene, phylogenetic tree, Wnt signaling, orthodontic applications, osteocytes and glycoprotein.